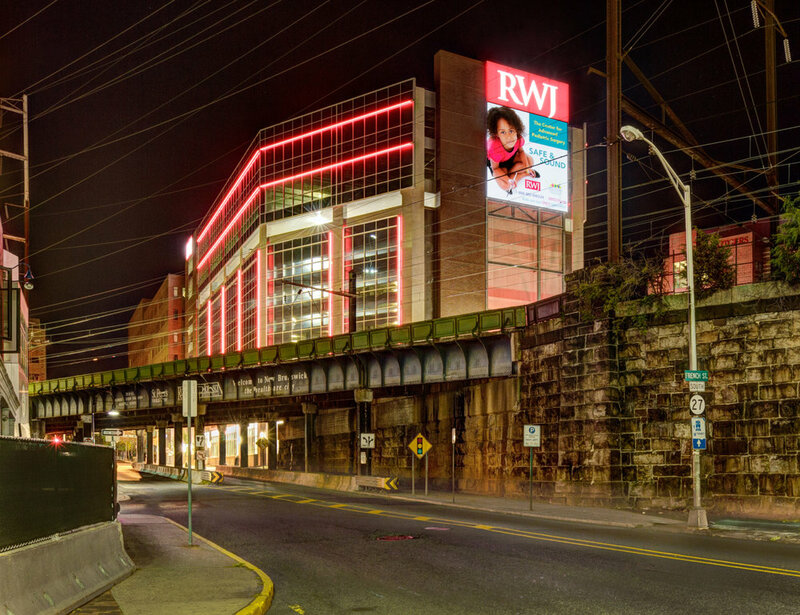 RWJBH’s new East Tower occupies one of the campus’ most prominent sites and is a major addition to New Brunswick’s growing skyline. It presents a new face for the Hospital to commuters riding the Amtrak lines which bound the southern edge of the triangular, sloping site. The 14-story building includes a below-grade sub-station for the Hospital’s emergency power needs, 700+ employee parking spaces and 155,000 square feet of office space. 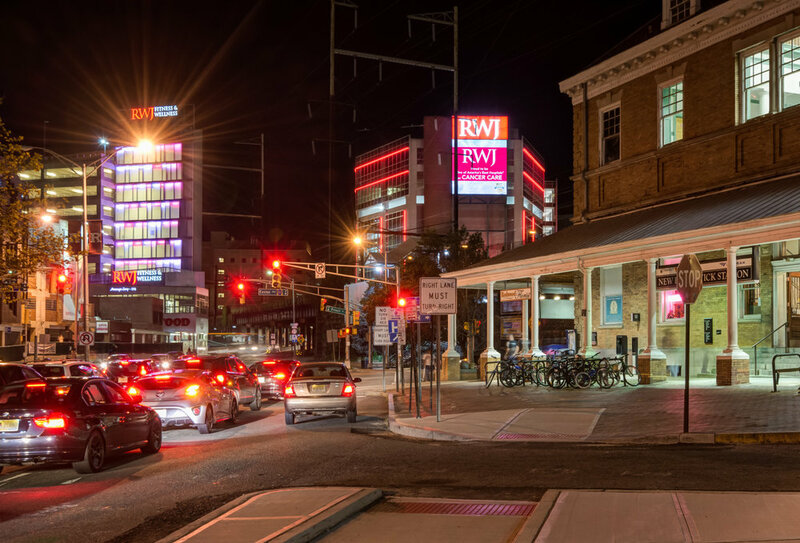 One particular design challenge was to provide a pedestrian link between the existing neighboring campus buildings, the neighboring Amtrak station and the site’s two major bordering roads in a controlled manner. 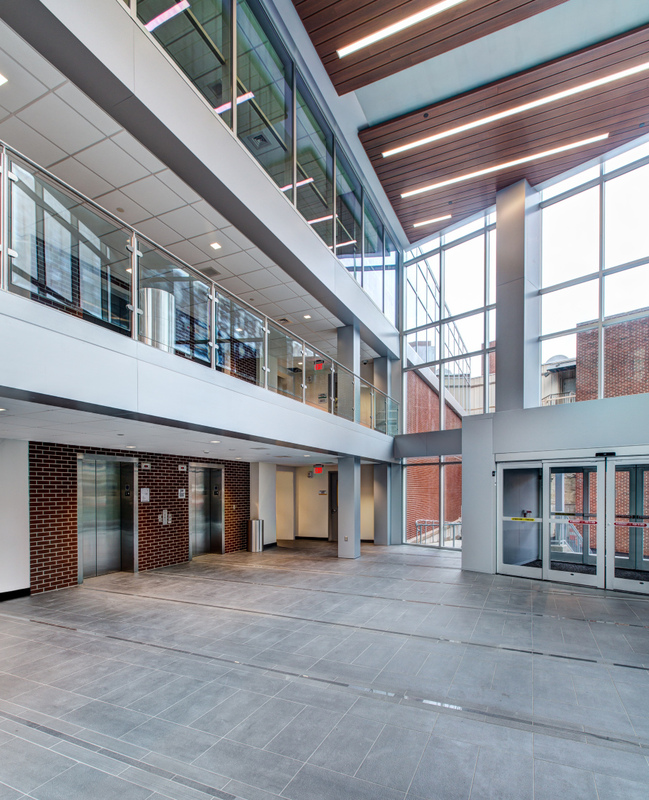 Using the site’s significant slope to its advantage, we created a centralized three-story lobby on Little Albany Street, successfully linking the campus, pedestrians and Amtrak station across multiple levels. To reduce the scale of this rather large building, we introduced smaller, pedestrian-scaled elements and a smaller, storefront curtain wall at street-level. Another significant challenge of this project was the desire of both the city and the Hospital that the 289,000+ square feet of parking garage within the tower not be recognizable as such on the exterior of the building. Responding to the structure of the tower being predominantly pre-cast concrete and the footprint of the building needing to fill as much of the site as possible, NK developed a concept using a mixture of curtain wall, brick and metal louver systems to give the tower a balanced facade that plays between the lightness of the curtain wall and the massiveness of the concrete and uses a material palette that is very much within the vernacular of New Brunswick. The tower’s most visible face, at the site’s Eastern edge, brings a Times Square-like presence to downtown New Brunswick with a mixture of public art and advertising as well as a 40-foot Jumbo-tron to greet visitors arriving at New Brunswick station. The careful design of an LED lighting system for the building’s large expanses of curtain wall and brick assures that the building is a visual anchor within the city both day and night.